Liquid Sunshine has a powerful scent and a little goes a long way. A small amount dabbed on the inside of the wrists or on temples can provide a boost that can last for hours. Whether you’re having a bad day or when you just want a delightful scent, Liquid Sunshine can help brighten your day. 4 ml Ready-to-Go* Rollerball – 100% pure & potent therapeutic grade essential oil blends expertly mixed with high quality fractionated coconut oil to make these rollerballs ready to use on the go with the ideal balance of aroma, potency & safety. 10 ml Rollerball – 100% pure & potent therapeutic grade essential oil blends expertly mixed with high quality fractionated coconut oil to make these rollerballs ready to use with the ideal balance of aroma, potency & safety. Add several drops to your unscented body lotion for a refreshing lotion. Note: This blend contains essential oils which can interact with sunlight(phototoxic). Do not use on your skin within 24 hours before exposure to sunlight or U.V. rays. We recommend if you are planning on spending time in the sun or a tanning bed, that you try one of the other methods of use. Otherwise, simply dilute and apply to areas not exposed to direct sunlight, such as under clothing. Caution (topical application): This blend contains essential oils which can interact with sunlight(phototoxic). Do not use on your skin within 24 hours before exposure to sunlight or U.V. rays. We recommend if you are planning on spending time in the sun or a tanning bed, that you try one of the other methods of use. View the single oil GC/MS reports on the individual oil product pages. Great oil! Love the scent! This smells just like Citrus Bliss and is a great value for the cost. I will purchase again. one of my favorite blends, thank you! I love it. Absolutely love the oils I received. Liquid sunshine is pure bliss. The Focus blend has an amazing smell. I ordered 5 more oils the day I got my first order because the ones I received were excellent. I also love that the roller balls are Metal and not plastic. Great happy scent. My son's favorite. Nice fresh, soothing smell. Perfect for spring and summer. This is one of my favorite blends. It smells so good and really makes the house smell wonderful and inviting when I put it in my diffuser. Love this eo! Is steam distilled, so no chemicals and the company website acutaully tells you what percentage of each type of plant is used and where it comes from. Good alternative and product to the outrageously expensive companies. Great Product. Fast Ship. Thanks! This liquid sunshine by Davia smells AWESOME!! It is a HUGE mood lifter & just makes me SMILE when I smell it!! One of my favorite oils. Amazing scent, I love anything citrus in my diffuser, & this one does not disappoint! Very uplifting in the gloomy winter weather we are having! A very good quality oil. I am appreciating this companies oils. I have a lot of essential oils but I love to try new blends. This might be my all-time favorite. This is such a light citrus and energizing scent I have been using it every morning so far. It is not overwhelming but is light and clean. I am going to have to buy this by the gallon as it is now gone ahead of lavender as my favorite. This is the best oil for making you feel good! I have found my favorite oil company. You can use in a diffuser or rub on the back of your neck and Temple and chest or put some in your palms together and inhale or inhale straight from the bottle. It works great! I love good quality EO's, and have spent a ton of money to ensure I am getting a good quality product. I wanted to try this brand that is new to me, and had to liquid sunshine, since I am so fond of "sunshine in a bottle". This is very similar and smells wonderful with the essential oils of Orange, Wild , Lemon, Sweet Orange, Ruby Red Grapefruit, Red Mandarin, Tangerine, Lime, & Vanilla. This blend is very uplifting and great to use when you are feeling tired, run down or depressed. I love using this in my car EO diffuser while commuting to work. It gives me a great little boost, and is helpful for tolerating the crazy drivers this time of year. It would work well for any situation where you want to be more alert, re-refreshed and energized. Definitely pleased with the product and quality so far. Hope this review was helpful. This comes in the traditional dark amber glass bottle. 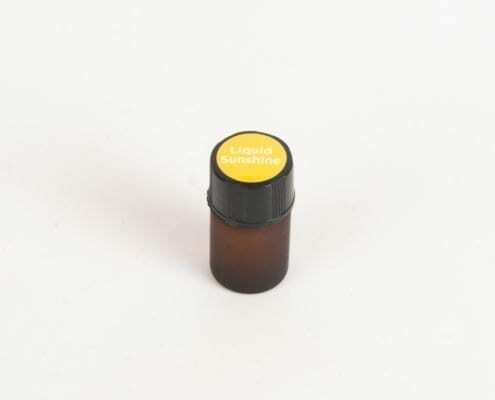 The bottle is strong and, with the amber color, protects the precious essential oils inside. It came rolled up in a SEALED bubble wrap, which , along with the tamper-proof plastic self seal that was in place, provided peace of mind that I received a tamper-free product (a HUGE plus, to me). Under the lid is an orifice reducer to allow just one drop out of the bottle at a time, which prevents waste and helps you to dispense just the right amount. I love that the top has a "Liquid Sunshine" label on it, as well as on the front of the bottle, since I store my oils in a divided wooden box. It is easy to locate this in my box. The label contains all of the pertinent information, such as ingredients, use, contents, company website information, purity certification with third party testing. I like that the botanical names are given in the ingredient listing, as well as the common names. The scent of this lovely Citrus Uplift or Liquid Sunshine Essential Oil Blend is wonderful, pure, and true. I absolutely LOVE it. I knew right away this was a quality blend of essential oils, but I did do a paper test to be sure (put a drop on a piece of white paper, allow it to dry, and watch for oily residue from non-essential oil additives, of which there were none). This is a lovely blend of pure essential oils. I have not purchased this brand before, but I will certainly purchase it again in the future. You just can't feel blue when you are smelling this blend. I put a few drops in my diffuser right away and am very happy with it. Incredible citrus blend. I am loving this blend. The smell is fresh and light and lingers for a long time. I first put a couple drops on my wrist to try it out and then added it to my diffuser in my home office. It really has a smell of happiness to it. In general I am a very happy person this is a fun new oil blend you have to try it. You can really smell the freshness of the variety of citrus in it lime, grapefruit, lemon, tangerine with a splash of vanilla. The quality of this brand is amazing and far better than the name brands I've tried in the past like young living or doterra. I truly feel like this is a better quality. The price is extremely good. This oil is one I will continue to order and gift my friends. This is truly uplifting, though I don't have depression, so I don't know about that part. I just know it smells sweet, but not too sweet, and it's very lovely. I plan to always have some on hand. I bought one of these 10ml bottles for a family member and they loved it. I'm going to have to stock up for Christmas, I think. Anyway, the scent lingers for quite a long time, but not forever, so I can put some on and I don't get sick of it. I wear it often after a long day and I never get tired of it. I keep having to get more cause my family members use it all! :) Nice that there's now this bigger 10ml bottle. I love this oil so much and I'm glad I have found this brand. I'm a consultant for a high end oil distributor and love using EO's daily, but I can not always afford spending tons of money on the oils. I've just used this and I'm in love. It smells absolutely great (almost like the high end equivalent) and I will purchase this again. I just ordered a few other oils from them and can't wait to try. Liquid sunshine is the most delightful and uplifting oil blend that I have ever had the pleasure of using. I recommend it to everyone! This blend is truly great. I would have never thought the key ingredient of vanilla would make such a difference to a citrus blend but it does. Australia, New Zealand, Canada, Malaysia & Singapore currencies are for information. Payment will be in USD.